Atomic Mouse. Another thing he has in common with those characters is that he gets his super powers by ingesting drugs. Wealthy Henry Cabot Henhouse III undergoes an apparently somewhat painful transformation to the fighting fowl whenever he drinks his Super Sauce. This substance is prepared by his valet, Fred (a lion), and is generally imbibed from a martini glass — giving rise to speculation on exactly what is meant by the word "sauce". As Super Chicken he flies around in his Super Coupe (or is it "Coop"? ), combatting crime and/or evil, assisted by the non-super Fred. Super Chicken was a segment in the short-lived but long-lasting George of the Jungle show, along with George himself and race-car driver Tom Slick. The show debuted in 1967. It was produced by Jay Ward Productions, the animation house also responsible for Dudley Do-Right, Rocky & Bullwinkle and other cartoons now considered classics. 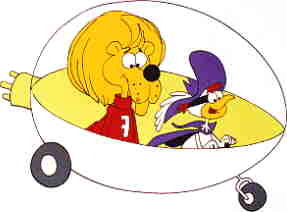 The voices of Super Chicken and Fred were done by Bill Scott and Paul Frees, respectively, both of whom were stalwarts of the Ward studio. ABC ran the show on Saturday morning for three years — but only one season of episodes was produced, and in the late 1960s that meant there was a grand total of 17 episodes to re-run over and over during that time. In 1969, Gold Key brought out a comic book version of George, which included a Super Chicken story in each of its two issues. And that is the entire body of Super Chicken material. After the show's ABC run ended, its episodes were syndicated for decades, before being given a couple more shots at network airing. Today, George of the Jungle, with Super Chicken as part of the package, can be seen on Cartoon Network. Text ©2000-05 Donald D. Markstein. Art © Jay Ward Productions.